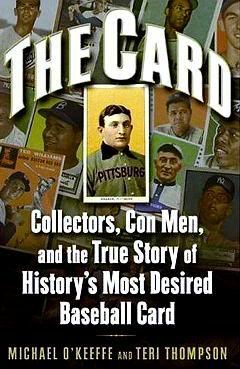 I recently had the chance to ask some questions about the hobby to Michael O'Keeffe, New York Daily News sports journalist and co-author of the book The Card which follows the history of the most famous rare baseball card- the Gretzky PSA 8 T206 Honus Wagner. The book describes many troubling things about the hobby and offers an inside look into the world of authentication and auction houses. 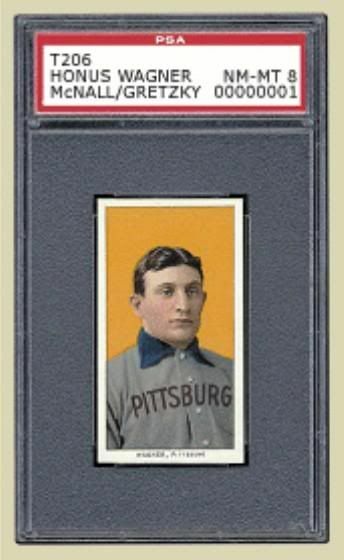 GAME USED FORUM: Your book The Card follows the history of the highest graded Wagner T206 card. There is the suggestion that somewhere along the way the card was trimmed to get a high grade from PSA. Do you know if it was trimmed by a collector or an auction house? 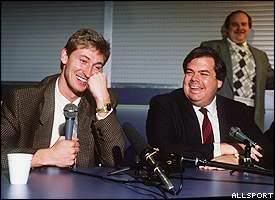 MICHAEL O'KEEFFE: Teri Thompson and I were told by two sources that Alan Ray, the collector who sold the card to Bill Mastro, and Bob Sevchuk, the memorabilia/card dealer who brokered the sale, cut the card from an intact sheet purchased at a Florida flea market. I don’t know who trimmed it after it left Sevchuk’s Long Island store. But I do believe it was trimmed somewhere between the time Ray sold it and Wayne Gretzky and Bruce McNall bought it. We recently obtained photos I believe are solid evidence the card was trimmed during that time frame – we published those pictures last month in the Daily News. GUF: You discussed auction houses doctoring cards. The Game Used Forum discovered a Kellen Winslow “game used” helmet which Mastro Auctions asked the authenticator Lou Lampson to alter. In your opinion, how can consumers know that game used items or baseball cards listed in auction houses are in their original form? MOK: I don’t really know– cards are especially tough since card doctors have become very sophisticated. I’m certainly no expert on card grading or authentication, so I’m afraid I can’t be of much help here. But I do think that with game-used memorabilia, people need to educate themselves thoroughly. Don’t take anybody’s word just because they work for a prominent auction house or have a big collection. Use common sense. Thanks to the Internet, photographs are easy to obtain – and so are opinions from informed collectors and honest dealers. I think the Game Used Forum is a valuable service in that regard. GUF: In The Card, you touch on conflicts of interest with game used authenticators. What are those conflicts of interest? MOK: I think one of the biggest is authenticators who write COAs for pieces they own and have consigned to auction, especially when they don’t share that information with consumers. If you were buying a car from a mechanic, you wouldn’t ask him to look it over before you made a decision. Why is it OK for someone to represent himself as an objective authenticator when he’s got a financial stake in the item? As we report in “The Card,” a lot of authenticators spend literally just a few seconds with a piece before they write COAs. I hear that’s because auction houses want these guys in and out– they don’t want to pay for the extra days it would take to do the job right. The relationship between authenticators/card graders and auction houses is way too cozy. I also think a lot of these self-proclaimed authenticators don’t have the experience or knowledge necessary to do the job right. GUF: Are these conflicts of interest illegal or merely unethical? MOK: I don’t know– I’m not an attorney or a prosecutor. I do consider that kind of behavior unethical. How can you take money from consumers and tell them they’re getting an independent, objective review of a piece of memorabilia when you a) own it or b) spent less than 30 seconds examining it or c) don’t know what you’re doing? GUF: What is your opinion on the state of the game used hobby? MOK: I think there are a lot of problems in the hobby and I’m amazed at the amount of crap people are willing to put up with in order to spend thousands of dollars on a card or jersey. I’m amazed at how blatant some of the hucksters in the hobby can be. GUF: From your experience researching the hobby, what needs to be changed and what needs to be disclosed? MOK: I think collectors, reputable dealers and honest auction houses need to stand up and say “We’re not gonna take it.” I think that has already begun – Robert Edward Auctions has done a tremendous public service in recent years by openly talking about the hobby’s numerous problems and Rob Lifson should get a lot of credit for that. The one thing that amazes me is how passive collectors are. You guys know who many of the problem people are – you talk about them all the time on the forum. But you act like getting ripped off comes with the territory, like it’s merely the cost of doing business. Why not boycott those auction houses and authenticators? I hate to break the news to you guys, but we really only need food, water and shelter to survive – you really don’t need a Cal Ripken jersey or a T206 Wagner. If people believe an authenticator is a crook or an incompetent, why keep buying stuff with his COAs? If an auction house misrepresents pieces, why keep buying their stuff? People should go to the police, the FBI, the Better Business Bureau and their local district attorney if they think they’ve been defrauded. I hear from people in the hobby all the time who want me to do a story because they got ripped off. When I ask them if they reported it to the cops, nine times out of 10 they say no. Maybe law enforcement won’t be interested; maybe they will tell you this is a civil dispute. But you won’t know until you try, and if the authorities hear enough complaints, they may be moved to act. I don’t think things will ever change until the problem people go out of business, go to jail or are hit with big fines. GUF: What did you learn about the sports memorabilia hobby from your work researching The Card? 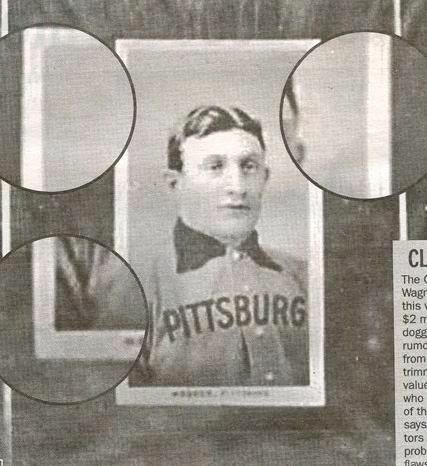 MOK: It was fun to learn about the history of cards and about Honus Wagner. It was great to go deep on a subject I’d written about in the past. GUF: You expose some questionable practices in The Card. Have you had any response from the parties involved? MOK: There was some saber-rattling from some lawyers before the book was published, but that’s it. GUF: You do a lot of investigative work on the sports memorabilia hobby for the New York Daily News. Anything you're working on that we should look for? MOK: I’m juggling a few things right now but I don’t know if they will pan out as stories so I better not say. I am curious about the rest of the press when it comes to sports memorabilia. How come the hobby publications (with some notable exceptions) are such pansies when it comes to asking the tough questions? Why do people buy these magazines that are little more than advertising flyers? Do people think anything is/will change in the hobby because of some of the investigative work being done? beyond simply educating the community, the ability of information to drive genuine change depends on the specific changes and on collectors' ability to translate thought into action. easier said than done. i think some things could change while others likely won't. ultimately, for change to occur, i believe those actions have to originate from the collecting community as opposed to the "industry". that is, i don't believe ebay, sellers, auction houses, or authenticators will do anything unless they're motivated financially. if they were motivated ethically then they would've solved these simple issues a long time ago. they exist simply because they're profitable. if they're to cease existing, then they have to become unprofitable. telling someone like lou lampson to do the right thing solely for the sake of doing the right thing is like telling barry bonds to be nice. to think that a person will change their unethical practices simply because they've been exposed is a big assumption. as long as the dollars keep rolling in, many couldn't care less about what people think. as with many things, money talks. the only thing that'd stop lampson is a lack of business. the big question is whether collectors will actually translate knowledge into action (ie: vote with their wallets). some will but, as surprising as it may seem, many won't. for them, the need for an item takes precendence. they'll say the item speaks for itself, without considering the fact that they're keeping the unethical entity in business. personally, this is just a hobby for me and i don't need to roll around in the mud so to speak. you've been a vocal critic of lampson, yet you've also regularly patronized his biggest employer, AMI. thoughts? Here are my rambling thoughts. Sorry if they seem disjointed. I want to see people go to jail for defrauding others. There are people who send jerseys to companies to add patches and nameplates and since they have the right specs, they get passed off as game used and people are taken advantage of. Those people have been reported to the authorities and I want them to be held accountable. Operation Bullpen could happen in our part of the hobby. Perhaps were are looking at an era where people are fighting back. Mastro is being sued by buyer Bill Daniels because they sold autographs with certs that weren't examined by those represented on the cert. The collector decided he wanted justice. The FBI is looking into allegations of a consignor bidding up his own items at Mastro. Historic Auctions and 100% Authentic (the complaint was sent to American Memorabilia) have been reported to the Better Business Bureau for not answering questions which proved the items they deemed "game used" were not. They both ignored the BBB when investigations were done. I agree, these things must start with us. Industry folks will not police themselves. Everyone is making money on their end, so why change things. Ebay gets the fees, auction houses get the fees, authenticators get paid, auction houses hide behind the authenticators and the authenticators (no, really just Lampson) doesn't provide contact information. Michael O'Keeffe does a great job exposing some of the chicanery in this business and I am thankful for that. To be honest, I thought this thread would have gotten a little more activity. We get a lot of people complaining about issues on this forum. There's nothing wrong with that- people are tired of getting ripped off. They have the right to cplain- BUT when someone is exposing the things going on like O'Keeffe does regularly- this is what we should be talking about! The Network54 thread about Mastro being investigated by the FBI in the vintage baseball card forum has 281 posts. We're barely talking about it here. I'm hoping that what will stop Lampson is either a lack of business or a government agency like the Federal Trade Commission, the group who oversees things like auctions, stepping in and saying "People representing themselves as authenticators need to have credentials." Wonder what would happen if the FTC told Lampson he had to prove he was qualified and be accountable for what he writes. And finally, to address what you wrote, you're right, I have been hard on Lampson for fooling people who might not know any better than to assume his name means an item is actually 100% Authentic. When I patronized AMI it was because I saw items I was comfortable with. I did my own homework and pretended basically that Lampson didn't even look at those things. As people mention on baseball card forums, it's tough to ignore the auction houses who are selling rare pieces you want. Perhaps I should have taken a stand and boycotted, but this is a hobby that I would like to enjoy, and if I started cutting off everyone who paid Lou Lampson then I would be out of the hobby. AMI banned me (and the other moderators on this site) from bidding in their auctions, so they made the decision that they don't want my business. You're right, I should have beaten them to it. Those are my answers. Dive in! so aside from proactive changes in the hobby, you'd also like to see prosecution for misdeeds. at face value, the information uncovered has the effect of educating the collecting community. i think the most common consequence of this education has collectors making smarter purchasing choices rather than encouraging legal prosecution. in the past 2 yrs, i've noticed a difference in buying trends on ebay and i believe it's due to this forum. as recently as 3+ yrs ago, you'd see all sorts of garbage items receiving multiple bids. you don't see that nearly as much anymore. additionally, i think much of the information uncovered has greatly reduced the trust that many collectors had in authenticators and auction houses. i think the general collecting community is seeing that, for all of their chest-pounding and hyperbolic bios, they aren't the experts they make themselves out to be. between collectors voting with their wallets and persuing legal action, i have to think the former is much easier. it's also likely to be more effective.it's a lot easier for a person to say they're not going to buy anything with lampson's name attached to it then it is to get law enforcement interested. if you recall, getting them interested in the marinos wasn't easy. eventually it happened because of the monetary scale of things. as well, legal action isn't always guaranteed to work. alternatively, killing the financial livelihood of anyone is more likely to put them out of commission than most lawsuits, fines, or even minor sentences. "To be honest, I thought this thread would have gotten a little more activity. ..The Network54 thread about Mastro being investigated by the FBI in the vintage baseball card forum has 281 posts. We're barely talking about it here." i think at this point, it's pretty much all been said and most people know. i think most people knew and agreed with everything o'keeffe said. "Wonder what would happen if the FTC told Lampson he had to prove he was qualified and be accountable for what he writes." i'd be impressed if the ftc even managed to contact him. seriously though, lou's fully aware that he's operating in an unregulated, unmonitored, "anything goes" industry and he takes full advantage of it. beyond a simple business permit, there are no formal qualifications, credentials, licenses, professional memberships, etc required in any of this. you don't even need a high school education. the only thing you need to do is convince people you're an expert, which lou has apparently done. the thing is, most people will believe anything if you keep telling it to them over and over. "I did my own homework and pretended basically that Lampson didn't even look at those things." i'm sure most others have the same mindset in that situation. the thing is, ignoring lampson is what enables this to keep going on. "..it's tough to ignore the auction houses who are selling rare pieces you want. Perhaps I should have taken a stand and boycotted, but this is a hobby that I would like to enjoy, and if I started cutting off everyone who paid Lou Lampson then I would be out of the hobby." understandably, it's a tough situation which forces a person to prioritize. i don't think there's an objective right or wrong here. what i am saying is that you can't have your cake and eat it too. if you prioritize your collection over the health of the hobby, then that's fine but you can't then also wish something would be done about lampson. conversely, if you prioritize the hobby over your collection, then you have to accept that you're going to miss out on some pieces. it's all up to the individual. i'd probably say that most are going to prioritize their collections and personal interests. if you really feel passionate about the hobby as a whole though, then i can't see why anyone would patronize lampson or his employers. it's like saying you're passionate about the environment, and then buying Exxon stock because it's personally profitable. i don't think you'd be cut out of the hobby though eric. i've never bought a lampson piece and have a nice little collection. to date, i've also never bought from GFC, Historic, Mastro, or AMI and couldn't care less if they banned me. getting out of auctions forces you to devise creative ways of finding pieces. anyway, AMI banning you and rob is so ludicrous it's comical. why was chris banned though.. simply for associating with you two miscreants? ultimately, AMI needs collectors more than collectors need AMI. afterall, the royalties from "is love still in style" must've run out by now. short addendum to my last post. when doug allen was caught in that facemask swapping debacle, dave grob took an admirable stance and prioritized his ethics over profit. recently he posted on the mears site about his efforts and desire to enact an industry wide association/industry wide standards. some of his comments seem relevant to this discussion. Until that time, I will focus my efforts on what MEARS has done and is doing voluntarily since this remains an unregulated industry. - Mandatory and public disclosure by all MEARS employees on the sale of their items either through an auction house or for sale via the MEARS Web Site. - Use of worksheets so collectors can see why a grade was given. - Archiving Letters of Opinion for future reference to include items deemed Unable to Authenticate. - Ensuring the collecting public has both private and public means to contact us should issues or question arise. Until such a time as the industry, outside of MEARS, decides upon collective standards and internal regulation, is forced to do so by legislative action, the only recourse or change agent will be the collecting public. I have made personal and professional decisions that have both inhibited my ability to work in this segment of the industry and add items to my own collection because there are just simply organizations and individuals I will not do business with." i'm going to venture that the lack of interest from industry sources is intentional. that is, they likely feel that it's in their best interests not to have any standards, regulation, or a governing body. typically, such things are at odds with profit. why impede the gravy train? where's the money in ethics or standards? most times, such things are established by governments for the best interests of constituents, not by private business whose sole interest in often in profit. beyond simply doing the right thing, there's no real incentive for an auction house or authenticator to go for what grob is suggesting. despite all of their yapping about integrity and ethics, many of their actions have shown they have little to no genuine interest in such things. there's too much easy money to be made in this industry for ethics to get in the way.